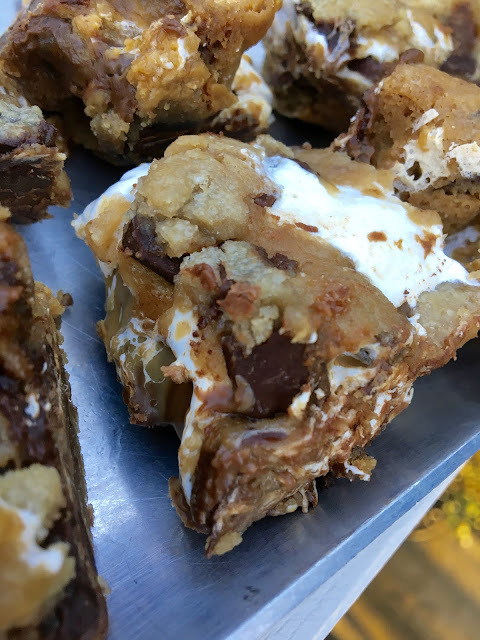 Last Saturday, Union Square celebrated the 99-year old invention of Marshmallow Fluff with its annual What the Fluff? Festival, a day filled with creative culinary twists on the sugary spread along with music and quirky games. On a sugar high from the fun, I decided to incorporate the local favorite into my own confection. Fluffernutter sandwiches were a go-to snack growing up. Our mom would slather creamy peanut butter and Fluff onto soft slices of bread for Kara, James and me on our way to whatever practice for whatever sport we were playing at the time. It was nearly impossible to enjoy the snack without getting the sticky marshmallow spread all over our mouths and fingers. For a sweet treat, I decided to spread these nostalgic layers in between chocolate chip cookie dough with a dusting of graham cracker crumbs on top. 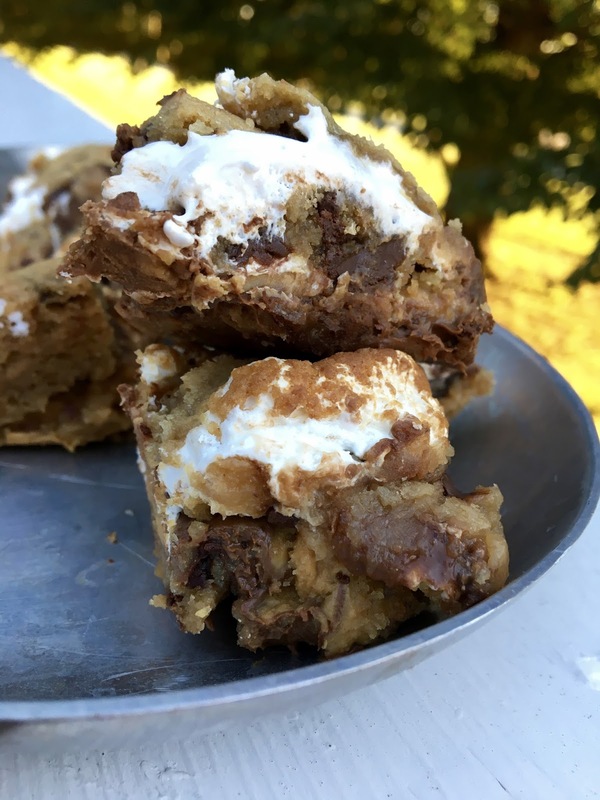 When baked, the layers transformed into a gooey, salty, sweet, medley. You got everything covered in this bars. Press half of the cookie dough batter into the bottom of the 9x9 baking pan. Place the remaining cookie dough in the fridge to firm. Next, press the dark chocolate bars into the dough, covering the entire surface. Next is the stickiest part: Do the best you can to cover the chocolate with an even layer of Fluff. I found the Fluff started to stick to everything (including my fingers!) so I sprayed a spatula with cooking spray to spread out dollops of Fluff. Sprinkle the graham cracker crumbs generously over the peanut butter. With a spreading knife, spread the peanut butter evenly over the chocolate. Take the chilled cookie dough out of the refrigerator and roll it out on a floured surface, as close to a 9x9 square shape as you can (doesn’t have to be perfect!). Place the large section of the dough to place over the Fluff as gently as you can. If it breaks, no worries at all. These step can be in multiple cookie dough pieces. Pat the dough into place, sprinkle the surface with flaked sea salt, and you’re ready to go! Bake for 25-27 minutes until the top is golden brown. There will be bubbles of Fluff popping through the dough while cooking which is totally fine. Allow the bars to cool for at least two hours on a wire rack. If you are tight on time, I recommend placing the pan in the refrigerator for at least an hour. If the bars aren’t completely cooled, you will be left with a mess! Cut into squares and enjoy! Makes 16-20 bars (depending how big you want them).